I wish I could take credit for the title of this post, but that goes to Patty McClarty, a family friend and faithful Wesley Memorial church member and choir pal of my mom’s. Patty came up with the motto “Admiration, Love, Support,” like she was Jon Scheyer swishing a championship 3-pointer to beat us in our blog title challenge. Despite my “damn, I wish I’d thought of that” grudge, we happily incorporated the motto on our prize-winning team T-shirt for the recent Catfish Hunter chapter “Walk to Defeat ALS” in Greensboro. It was a grand day, an outpouring of admiration, love and support. 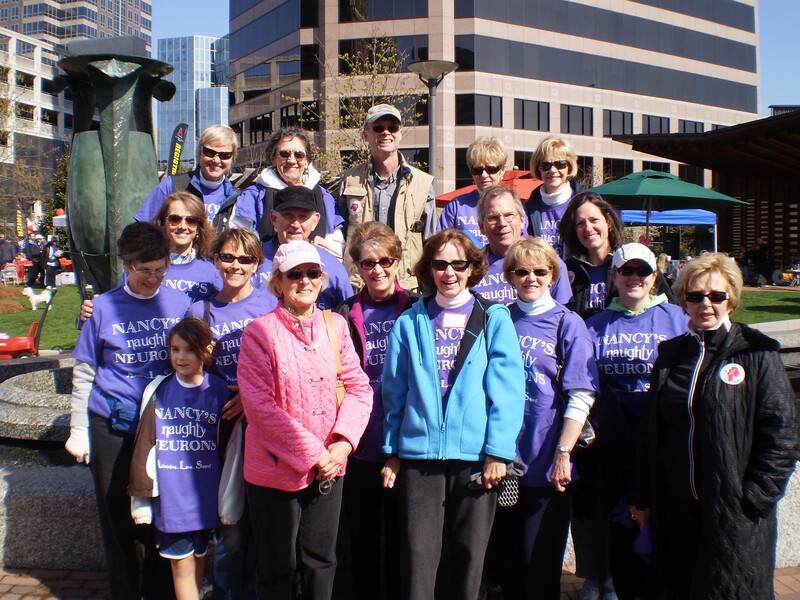 Two bus loads of my mother’s friends gathered round on the bright, chilly Saturday morning to walk beside her and cheer her on. They donated over $10,000 to ALS research and toward grants to assist local people struggling with the financial burden ALS can bring. I never realized how far a two mile walk can take you. That short stroll took me deep into my past, walking alongside people I hadn’t seen in decades — the dear McGuinns, the haven’t-aged-a bit Washburns, Mrs. Shaw, the Randalls, Sujette and David Brown, Mary Wood — people whose names, smiles and voices unleashed miles and miles of memories. And those two miles inched me closer to the future, to a reality I know is on the horizon but I try to ignore, as concerned friends would quietly ask, “what are your plans when Nancy can’t…?” (fill in the blank). But mostly, those short sweet two miles grounded me firmly in the present, in the dense here-and-now filled with, yes, one more time — Admiration, Love and Support, which is all that we have, and all that we need. ~ by Stephanie on 04/09/2010. What a wonderful group of ladies that surround your dear mother. Next time let the blog world know, and I’m sure we can contribute to a virtual walk for ALS!